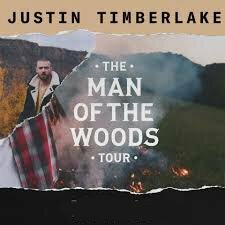 Global superstar Justin Timberlake announced today that he will make his highly anticipated return to the stage with The Man Of The Woods Tour. Produced by Live Nation Global Touring, Wright Entertainment Group, LBI Entertainment & Tennman Touring, the North American outing will kick off March 13 in Toronto and stop in 27 cities, ending in his hometown of Memphis on May 30. American Express Card Members can purchase tickets before the general public. For dates on sale to the general public on Tuesday, January 16, the American Express presale begins Wednesday, January 10 at 10am local time through Sunday, January 14 at 5pm local time. For dates on sale to the general public on Monday, January 22 the American Express presale begins Wednesday, January 17 starting at 10am local time through Sunday, January 21 at 5pm local time. For dates on sale to the general public on Monday, January 29 the American Express presale begins Wednesday, January 24 at 10am local time through Sunday, January 28 at 5pm local time. The Grammy Award-winning, multi-platinum selling artist was nominated for an Academy Award in 2017 for the song "Can't Stop the Feeling!" from the film Trolls, for which he also won his 10th Grammy. As an actor he has appeared in a variety of films including Alpha Dog, Black Snake Moan, Shrek The Third, The Social Network and most recently Wonder Wheel. Additionally, Timberlake has won four Emmys for his appearances on Saturday Night Live.